Well I thought spring had sprung, the daffodils have been and gone, the hyacinths are blooming and........... then suddenly we had hailstones the size of peas and it was back on with the winter woolies! Weird. But then I guess spring is the unpredictable season. I do like warmth so lets hope we're in for a good summer. This week has been the London Book Fair at Earls Court. I didn't go but I know from my agent that my books were there. Fingers crossed for some more foreign sales. I had my dreaded appointment at Moorfields last week and have a six month reprieve from further surgery. I was so concerned that I would fall further back on my deadlines but all is well. Moorfields is a hospital I can't praise enough. Well managed, well staffed and clean. I can see why its one of the best facilities in the world. I am full of admiration. I'm currently trying to decide which conferences to go to this summer. RNA and Southern Writers are both in Chichester but at different venues, Swanwick is in Derbyshire as always and Caerleon is in Wales. Time restrcitions mean I can only go to two. Decisions, decisions. Now I have to get back to edits. till next time. Just a very quick note.... I've updated my MySpace and Facebook pages so if you're on either / both of those then do go and have a look. Several readers have asked me recently about my very static website! Because I'm in the process of changing the 'manager' it's still up there, but has not been updated. I can't do it myself. I so wish I was techy minded! As soon as the new website is operational I'll let you know, meanwhile, the background info remains the same and the latest news is on the blog. On Sunday I gave a talk at Canvey Island Library in Essex as part of the Essex Literary Festival. It was a brilliant event that I enjoyed so much thanks to a big, interactive audience of avid readers. I just hope they all enjoy the books of mine they borrowed and bought. Many thanks also to all the staff who worked so hard to set it up. I love going to libraries! The Essex Festival is a brilliant showcase for authors of all genres, fiction and non-fiction. I am a keen supporter and look forward to it every year. Well done Essex. Roll on 2009! 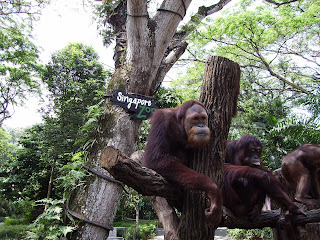 This is a gratuitously 'aaaaah' photo from Singapore Zoo, 2006. Don't we all know someone just like that?